Hera was the wife of Zeus who was brought up by the Titans Ocean and Tethys and although she was called "cow-faced" she was truly one of the most beautiful goddesses. Despite her beauty her personality was not very attractive since she was very cruel usually organizing revengeful acts against Zeus' lovers. In one, and only one, myth is shown as a noble and gracious protector of heroes and inspirer of heroic deeds, the Quest of the Golden Fleece. Hera was obliged to marry Zeus although she didn't like him at all. Zeus had courted her unsuccessfully for some time and when he saw that this wasn't working he disguised in an injured bird and when Hera, feeling sorry for it, put it near her breast to warm it, Zeus, taking advantage of the situation raped her. Then, despite her will she had to marry him to cover her shame. Since Zeus was anything but a faithful husband Hera from her part, was not a loyal wife. Many times she has turned against him convincing the other gods to revolt against him. Hera drugged Zeus and the other gods tied him down but since they hadn't decided what to do next they started quarreling over his head who would take his place. Briareus overheard the arguments and full of gratitude untied the knots and set him free. Zeus sprang from the couch and grabbed his thunderbolt. As the gods fell to their knees begging and pleading for mercy, he seized Hera and hung her from the sky with gold chains. She wept in pain all night but, none of the others dared to help her. The weeping kept Zeus up and the next morning he agreed to release her if she would swear never to go against him. She had little choice but, to agree. 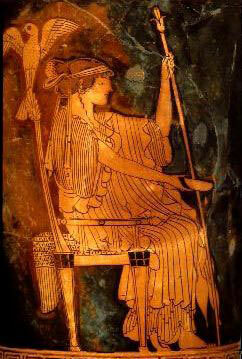 While she never rebelled again, she often intrigued against Zeus' plans and she was often able to outwit him. Zeus was the sixth child born to Cronus and Rhea and his power, although great, was not boundless, Zeus had no control over the fates and destiny. Like all Greek divinities, Zeus was subject to pleasure, pain, grief and anger, but he was most susceptible to the power of love, which often got the objects of his desire in a lot of trouble with his wife, Hera. Hera was the goddess of marriage and protector of married women. Her sandals, chariot and throne were all of pure gold, but that was not uncommon with the gods. Her animal is the cow, the peacock, and sometimes the cuckoo. Hera had her own messenger, the winged, rainbow goddess Iris. When she was not delivering messages she was sleeping under Hera' s bed and she was one of the few who could visit the underworld (and come back) to fetch water for solemn oaths. She was wearing a dress of iridescent drops. Hera's favorite cities were Argos and Sparta and she had no distinguishing features so she can only be identified in artistic representations by either inscription or context.